Hello! Let's give this Blogger app for my phone a go and see how it works. These photos are all taken with my phone, so excuse the poorer-than-usual quality. On-the-go posts are never quite the same! For this, I used a base of OPI You Callin' Me a Lyre?, very sheer pink and my favourite for French manis. 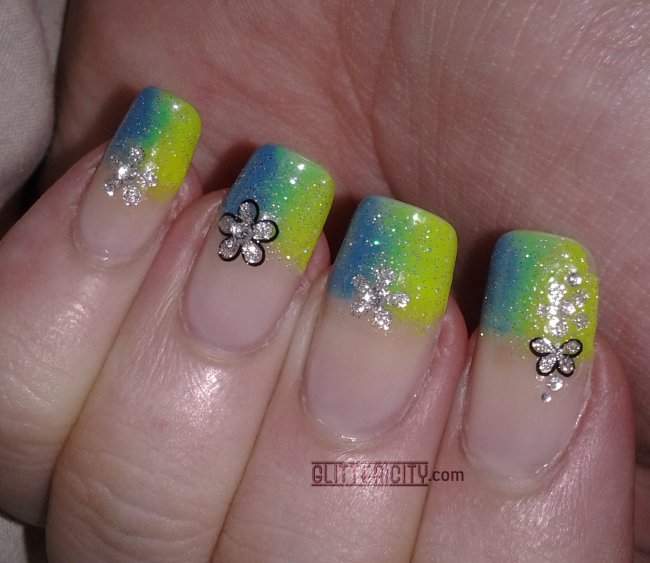 The gradient tip is done with a makeup sponge and two Orly polishes, Glowstick (neon yellow) and Blue Collar. I wanted more green in the middle as the two blended, but it didn't really work out. There's still a bit :) Over top of that, two coats of China Glaze Fairy Dust for sparkle, and the flowers and butterflies are from a sheet of decals by Cala. Finally, topcoat of INM Out The Door. The silver is Revlon #928 Silver Dollar, and I used two coats for the tips on most nails, covering the entire ring fingernail for the accent. 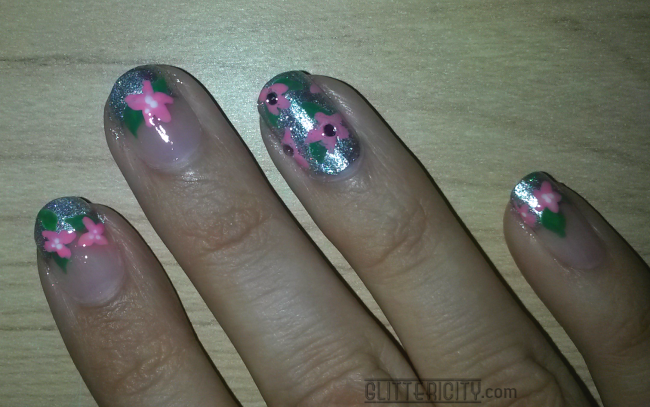 The pink flowers are Revlon #280 Bubbly & #911 Pink Chiffon, (yes, lots of Revlon in this mani!) and the dots in the centres are Ulta Snow White. The leaves are China Glaze Starboard and Orly Fresh. 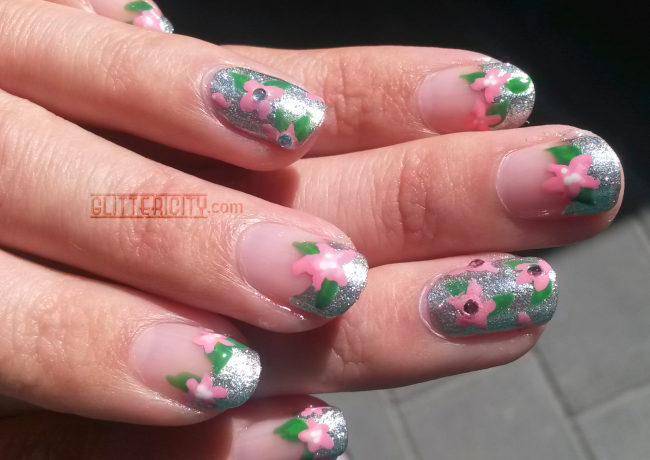 I used a small brush and dotting tool to create the flowers. Last, for the accent nails, I used 1mm clear rhinestones to add some sparkle and subtle bling to the middles. INM Out The Door topcoat sealed it all in. I am back home now, but unfortunately she and I both ended up with a touch of cold or flu or some such by the end of the week. I apologise for being late with this post and the promised finish of my Indie Polish swatches--the latter will be up ASAP! After some hot tea and a nap.